Like a bemused child that has awoken with a start, the blushing, innocent flowers of Schizostylis ‘Pink Princess’ have opened their eyes during the midst of our watery winter. 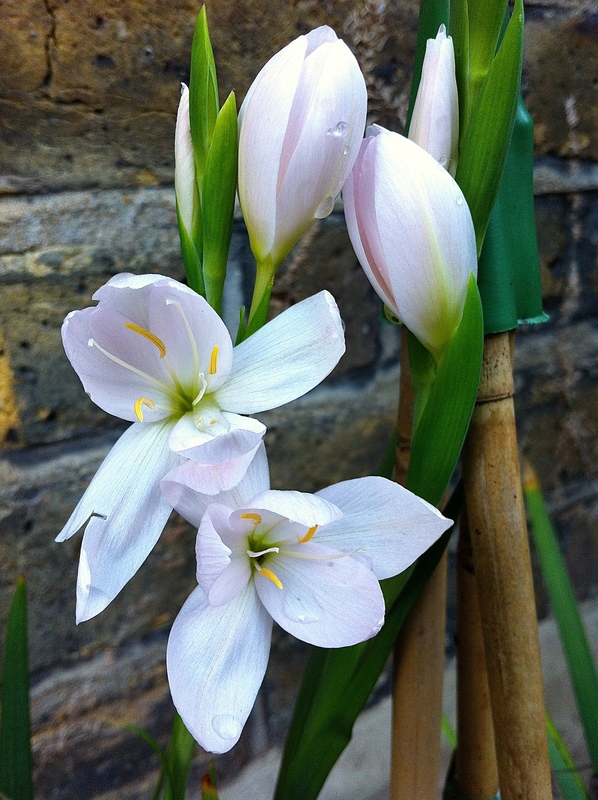 Kaffir lilies, as they are commonly known, have normally gone to sleep by Christmas, their flowers deterred by frost. This year they have merely been snoozing, with one eye on the lengthening days that lead towards to spring. Quite what has roused them, other than the sound of thundering rain, I don’t know, but they are sight for sore eyes. Sheltering in pots in the lee of our wall they have avoided complete saturation and perhaps been prompted into bloom by warmth from the building. With the garden as sodden as I have ever seen it, the soil drummed down and compacted by the rain, these surprisingly robust flowers are an absolute joy to behold. More flower stalks suggest there will be further blooms to come. Long may they continue to stay awake, even if they do have to endure another drenching and battering tonight.